I bought this cool gold notebook from Nood, but noticed it was a bit smelly. Not wanting to waste it, I had the idea of leaving it somewhere where people could write something in it for others to read. Sort of a writing version of the Book Connection. And post-earthquake, maybe people could vent their spleen in a smelly story. 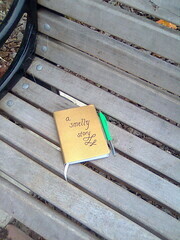 So I left it on the corner of Dublin and Dorset Streets, Christchurch – on a nice park bench, with a pen. By the time I got home from work it was gone, replaced by a novel called Blind Rage. The next day, Blind Rage was gone.